Savage Arms has revolutionized the bullet trap industry with their Snail® Systems Bullet Traps. The bullet trap design incorporates low angle ramps that deflect the bullet rather than smashing it, minimizing lead dust for a safer shooting environment. 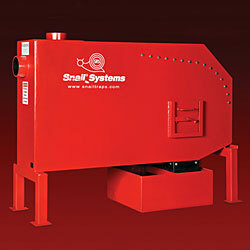 The bullet is deflected into a circular deceleration chamber where it slowly decelerates until stopping and dropping into a collection bin for optional recycling. No other bullet trap is as safe or environmentally sound. That's the Savage difference! Forensic Buddy® Developed as an efficient, non-destructive method of capturing bullets without the expense, mess and maintenance of water tanks, the Forensic Buddy meets all of the demands of the forensic community. Extremely compact, economical and designed for single-shot use, either in the lab or as a portable unit, the Forensic Buddy contains a unique ballistic media that carefully collects specimens intact - so you can get a clean, accurate view of Land and Groove impressions. If you need the best specimen for microscopic comparison, the Forensic Buddy has no equal. 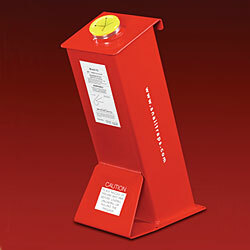 The Forensic Buddy's special ballistic material, within an interior capsule, stops the bullet with controlled deceleration and it then rests inside a canister. Just insert the muzzle of the handgun into the opening, aim straight and fire. Raise the back plate, remove and open the canister, pour the contents into the collection tray and remove the bullet. The media is reused and the plastic plug at the opposite end of the canister, where the bullet entered, is easily replaced when necessary. The Lexan shell catcher protects the shooter from ejected casings. Just shoot straight into the opening for reliable results. Portable, less than 60 lbs. Safe capture of all handgun projectiles up to 454 Casul. Quick "shoot and collect" cycle of less than 60 seconds. The Check-it!™ Series bullet traps are designed as a firearms "clearing station," to ensure no live ammunition is present before storing or cleaning a firearm. Each Check-it!™ bullet trap uses Snail® System low angle ramps and circular deceleration chamber to safely capture bullets. The low angle ramps help deflect the bullet into our round deceleration chamber where the bullet loses energy. This series has two space-saving designs and is uniquely engineered for shooters who want to keep a safe environment. 13" x 4" x 15"
These are durable and easy to use stand alone units. 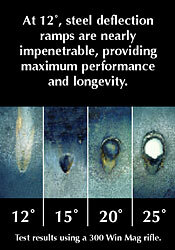 The Gunsmith Series bullet traps use Wet Snail® technology to minimize airborne lead. The low angle ramps help deflect the bullet into our circular deceleration chamber where the bullet loses energy and drops into a collection tray. This uniquely engineered design is ideal for testing the functionality of a myriad of firearms and for anyone who is serious about eliminating an environmental health and safety problem. 47" x 18" x 54"
Specialty Traps - velocity, accuracy, feed & function testing up to 8100FPE The Boxtrap Series bullet traps are designed for ballistics labs, firearms manufacturers and military facilities who are serious about eliminating environmental health and safety problems. 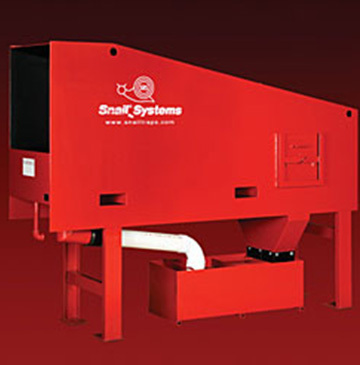 The Boxtrap Series uses Wet Snail® Technology to minimize airborne lead. The low angle ramps deflect the bullet into our circular deceleration chamber where the bullet loses energy and drops into a collection tray. 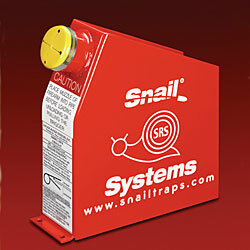 The Proof & Function bullet trap, great for manufacturers who are serious about eliminating an environmental health and safety problem, uses Wet Snail® Technology to minimize airborne lead, low angle ramps deflect the bullet into our round deceleration chamber where the bullet loses energy and drops into a collection tray. 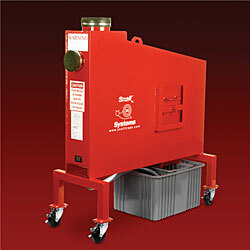 It has a self-contained lead-recovery tank and impeller pump to recirculate fluid. Not for use with steel core or armor piercing ammunition. Prices are subject to change without notice. Prices are FOB Factory. All shipping prices valid for domestic sales to contiguous USA only. Please contact Savage Range Systems for export shipping rates. Sizes and weights are approximate. As a part of Savage range Systems, Inc. commitment to quality, we reserve the right to change materials and/or specifications without notice. 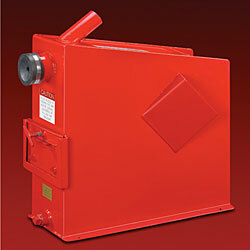 Savage Range Systems' Model 850 Box Trap has been safely capturing full auto .50 cal (mz)rounds for over 20 years. Available with custom size apertures from 24"x24" up to 130"x96". The Model 850 can safely and effectively satisfy all of your full-auto weapons testing requirements.